Mayo are through to the All-Ireland football final for the second year in a row following a convincing six-point defeat of Tyrone at Croke Park. Although James Horan’s side struggled in the first half, they managed to go in at the break just a point down – 0-7 to 0-6 – after playing very poorly. At the start of the second half they flexed their considerable muscle and moved well clear. An Alan Freeman penalty in the 40th minute was the crucial score, the Aghamore man finding the back of the net after Colm Boyle had been fouled. Freeman proved to be the match-winner, hitting 1-4, an especially crucial tally given Mayo lost Cillian O’Connor early on. Mayo hit 1-4 without reply in that excellent spell at the start of the second half, and that proved to be the decisive burst as they coasted to victory in the end. The first half was marred by injuries to key players, with Mayo losing O’Connor and Tyrone forced to cope without Stephen O’Neill and Peter Harte. Harte was gone inside the first 10 minutes after shipping a heavy knock to his hip, while O’Neill was forced off after 27 minutes. Remarkably, Tyrone led by 0-7 to 0-3 after 32 minutes when Ronan O’Neill snapped over a score shortly after coming on as a sub for the injured Stephen O’Neill. Mayo looked completely lost having had a Freeman goal disallowed earlier, when the referee blew for a foul just after he had fired a shot past Pascal McConnell, the Tyrone goalkeeper. Inexplicably, Kevin McLoughlin struck the resultant free wide. However, Mayo regained their composure just in time to hit the final three points of the half, with Chris Barrett landing a brace of scores and Lee Keegan also chipping in. Despite playing their poorest half of the whole season, Mayo were just a single point in arrears at the break. Enda Varley had Mayo level within two minutes of the restart, and the Westerners never looked back after that. Freeman slotted over a free just after the brilliantly-taken penalty and Alan Dillon quickly added a terrific score from play. When goalkeeper Robert Hennelly nailed a long-range free, they had turned a one-point deficit into a six-point lead in 11 minutes. Although McCurry and Aidan Cassidy pulled scores back for Tyrone to reduce the gap, Mickey Harte’s side were second best for most of the second half. 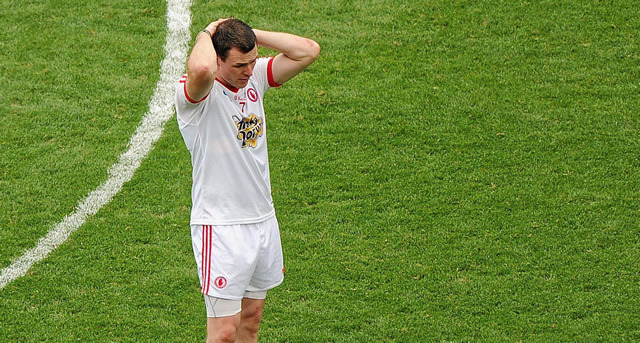 Scorers for Tyrone: C McGinley 0-1, S O’Neill 0-1, C McAliskey 0-2, D McCurry 0-4 (0-2f), R O’Neill 0-1, A Cassidy 0-1, S Cavanagh 0-2 (0-1f), K Coney 0-1. Scorers for Mayo: C O’Connor 0-1 (0-1f), K McLoughlin 0-1 (0-1f), A Freeman 1-4 (1-0 pen, 0-3f), C Barrett 0-2, L Keegan 0-2, E Varley 0-1 (0-1f), A Dillon 0-2, R Hennelly 0-1 (0-1f), A O’Shea 0-1, C Carolan 0-1. 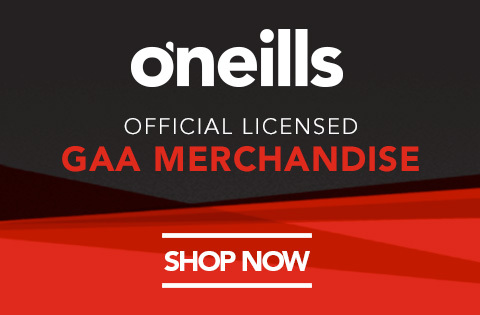 TYRONE: P McConnell; R McKenna, C Clarke, C McCarron; C McGinley, P Harte, C Gormley; C Cavanagh, S Cavanagh; Matthew Donnelly, Mark Donnelly, Joe McMahon; D McCurry, S O’Neill, C McAliskey. Subs: D Carlin for P Harte (7), R O’Neill for S O’Neill (27), R McNabb for Joe McMahon (44), A Cassidy for Matthew Donnelly (48), K Coney for R O’Neill (58). MAYO: R Hennelly; T Cunniffe, G Cafferkey, C Barrett; L Keegan, D Vaughan, C Boyle; A O’Shea, S O’Shea; K McLoughlin, K Higgins, A Dillon; C O’Connor, A Freeman, A Moran. Subs: E Varley for C O’Connor (11), M Conroy for A Moran (55), C Carolan for T Cunniffe (58), R Feeney for D Vaughan (64), B Moran for A O’Shea (68). 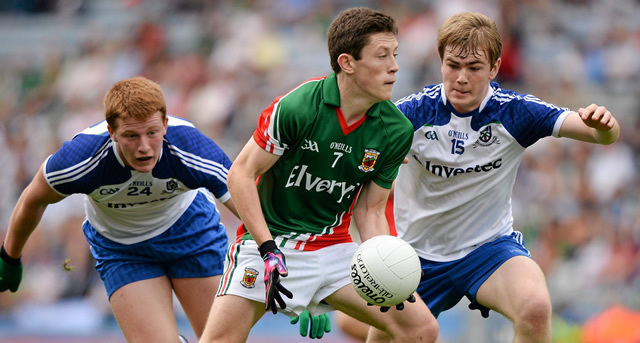 Mayo are through to the Electric Ireland All-Ireland minor final on September 22 following a very convincing win over Monaghan in the first game of the afternoon at Croke Park. The Mayo goals came from Conor Loftus in the first half and two from centre-forward Michael Plunkett in the second. Conor McCarthy had hit the back of the net for the Farney men in the 24th minute, but the Westerners responded superbly and were 1-10 to 1-6 ahead at the break. The game was as good as over when Plunkett hit his first in the 35th minute, tapping to the empty net after Pádraig Prendergast’s shot hit a post and fell into his path. The Ballintubber youngster added a second on 54 minutes to put his side well clear. MAYO: M Mulligan; E Doran, S Cunniffe, D Kenny; M Hall 0-2, S Coen 0-2, S Conlon; V Roughneen, D O’Connor; C Loftus 1-1, M Plunkett 1-2, C Hanley; D Doherty 0-4, L Irwin 0-3 (0-2f), T Conroy 1-2. Subs: P Prendergast 0-2 for Hanley, C Byrne 0-1 for Doherty, R Finn for Doran, J Langan for Plunkett, F Duffy for Irwin. MONAGHAN: C Forde 0-1 (0-1 ’45); S Treanor, K Loughran, P McArdle; A Kieran, R McAnespie 0-1, M Murnaghan; M Brown, M Magee; M O’Dowd, A Curran, D Ward; C McCarthy 1-4, D McAllister 0-3 (0-3f), F McMahon 0-2 (0-1f). Subs: D Meegan for Brown, N Loughman for Kieran, B McGinn for O’Dowd, C Martin for McArdle, A Treanor 0-1 for S Treanor.